We are a leading Manufacturer of powder applicator machine from Umbergaon, India. 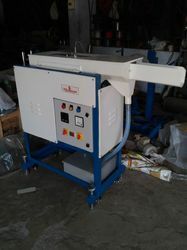 We are offering Powder Applicator Machine. Powder Applicator Machine is suitable for 2 core/3 core/4core flat cables. It is used to apply talc or powder to a wire, cable, and other stranded materials during the manufacturing process. Its a simple and durable design lends itself well to a long product lifespan. Looking for Powder Applicator Machine ?